Home » Events and Blogs » Blog » Recipe of the week: Mediterranean Prawns! 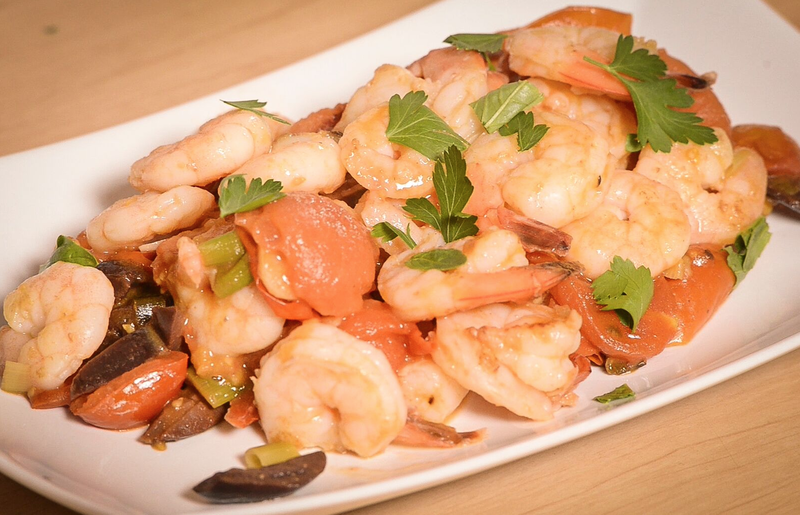 Recipe of the week: Mediterranean Prawns! Gently cook 2 of the finely sliced garlic cloves in 3 tablespoons of oil for a minute or so on a low heat. Add to it the tomatoes, sliced in half, the olives, shallots and a little salt and pepper. Have the heat turned down very low and gently fry for about half an hour. In another pan place just a splash of oil and the remaining 2 garlic cloves and gently cook over a low heat for a minute or so. Add the prawns and cook until done. This won’t take long. About 5 minutes. A few minutes each side until they have turned a light orange colour. Remove them from the pan and place them in a bowl to prevent further cooking. Mix a couple of tablespoons of the sauce through with the prawns. Spoon the prawns out onto each serving plate with the remaining sauce spooned evenly over each of them. Garnish each meal with the fresh basil, parsley and oregano torn into pieces over on top. You could serve this on its own as a light meal, or stirred through some cooked quinoa pasta for a more filling dish.